This page contains a list of images on which names have been placed adjacent to features. The files are in Adobe Portable Document Format (PDF), and you must have the free Adobe Acrobat Reader installed on your system to view them. Images courtesy of the USGS Astrogeology Science Center unless otherwise noted. Color of type was chosen for readability only. Titan with ISS background Not all features are shown on this map, however a few features, including some faculae, planitiae and regiones, can be seen better here than on the VIMS maps. Map covers area between 90°N and 90°S. Titan with VIMS background and RADAR strips All named features between 50°N and 90°S are included. Map covers area between 90°N and 90°S. Titan VIMS image Only prominent albedo features and a few other features that are easily distinguished are included. Map covers area between 90°N and 90°S. Titan North Pole Includes features that are between 50°N and 90°N. The image is false color Cassini RADAR that distinguishes liquid hydrocarbon from dry land. Titan South Pole Includes features that are between 50°S and 90°S. 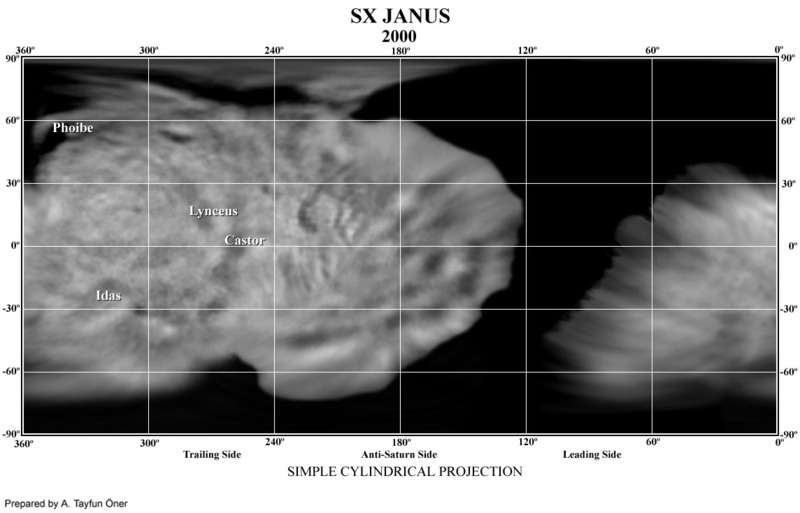 The image is false color Cassini RADAR that distinguishes liquid hydrocarbon from dry land.